The Folded part drawings tool is a simple application that helps the user to create workshop drawings of folded parts including both the folded and unfolded shape. This is achieved by creating two workshop drawings of each folded part, one folded and one unfolded. The views from the second drawing are then copied or linked into the first drawing. 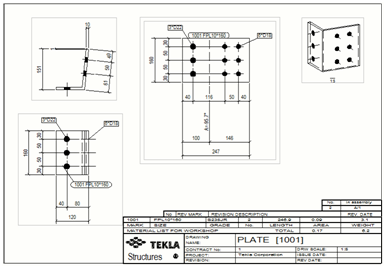 Download the Folded part drawings installer package from Tekla Warehouse. For more information see Downloading an application from Tekla Warehouse. Search for Folded part drawings and then double-click to open it. , or set the properties to be used for drawing creation. Select the drawing properties for the folded drawing and assign a drawing sheet number. Select the drawing properties for the unfolded drawing and assign a different sheet number. Select whether to link or copy the drawing views, and optionally delete the unfolded drawing if copying views. Selection filter chooses model objects according to object properties. Selection filters can be standard or user-defined. For example, selection filters can be used to select parts for drawings or analysis. if creating a drawing for all parts by filter. If creating drawings for selected parts, select the parts now. Click Create drawings to start the drawing creation. The progress of drawing creation is shown in the progress bar. The screen is active while drawings are created and several dialogs are opened and closed during the creation process. Do not attempt to perform any actions until the drawing creation is complete. A notice is displayed in the status bar when the drawing creation is complete. is up to date for all the selected parts. Drawings are only created for polybeams even if regular beams or contour plates are included in the selection. If a drawing already exists for a part, use one of the specified sheet numbers that drawing will not be overwritten, but linking or copying of views is not done. Drawing properties (Folded) The workshop drawing properties used to create the folded form drawing. Sheet number (Folded) The sheet number which is assigned to the folded form drawing. Drawing properties (Unfolded) The workshop drawing properties used to create the folded form drawing. Sheet number (Unfolded) The sheet number which is assigned to the unfolded form drawing. Link drawing views Select this option to link the views in the unfolded drawing when copying to the folded drawing. Copy drawing views Select this option to only copy the views from the unfolded drawing to the folded drawing. Copy and delete drawing Select this option to delete the unfolded drawing after views have been copied. You cannot select this option if Link drawing views is selected. Selected parts Select this option to create drawings for the currently selected parts only. All parts by filter Select this option to create drawings for all parts in the model based on a selection filter. Select the selection filter to be used from the drop down list of selection filters. The properties in the Folded Part Drawings tool can be saved and loaded just like any in other Tekla Structures dialog box by using the Save and Load buttons at the top of the dialog box. The properties are saved with the file extension FoldedPartDrawings.Attributes.xml. The properties files can be placed in the system, XS_FIRM, XS_PROJECT, or model attributes folders.